There are 16 contestants to start out. They each give their backgrounds and a number of them work for past Top Chef contestants. Something about the cast this seasons seems very interesting and appealing. I am already intrigued by them. The first challenge is a sudden death quick fire and has the contestants split into four groups. It is the usual Top Chef first challenge that involves speed and culinary skills / “Mise En Place” tasks. Each team has four stations with local New England ingredients: 3 lobsters, 20 oysters, 8 Boston mackerel, 21 clams to cut, open, or filet depending on the ingredient. The slowest chef on the slowest team will face elimination. It was a neck and neck race with the chefs definitely showing their strengths while others showed their weaknesses. In the end, the red team which consisted of Melissa, Joy, George, and Gregory ended up losing the race. George Pagonis, who is a business partner with former Top Chef contestant Mike Isabella, was ultimately the slowest chef on that team. George was then instructed to pick a chef to go head to head with in a sudden match cook off. If George won, they would both stay, if he lost, he would be eliminated. George felt Gregory didn’t do well on the mackerel and was the reason for the team’s failure, so he chose him as his opponent. The two got 20 minutes to cook a dish using any of those local ingredients. George chose the mackerel, Gregory chose mackerel, lobster, and oyster trio. Pretty impressive to choose three dishes instead of just one. Ultimately, Gregory impressed Richard and Padma the most with his dish and therefore since George packing. The four judges reconvene to discuss the dishes…. the ones they loved and the ones they hated. Padma then tells the chefs that the the judges would like to see…. all of them. Usually it’s either the chefs with the top three or the bottom three dishes. So this is a twist. Doug, Mei, Gregory are asked to stay where they are and everyone else is asked to step to the side. Those three served the favorite dishes of the night. Richard announces the winner as Mei (from Dearborn, MI! Woot woot!) . Then Padma calls up Katie, Michael, and Katsuji. Katie’s broccoli salad the judges felt wasn’t appropriate for the festival. It was more of a side dish and the bacon powder, they felt, didn’t serve a purpose. Michael’s corn soup had salmon in it and was too fishy. Katsuji’s just had too much going on with about 20 ingredients. Padma then instructs Michael to pack his knives and go. 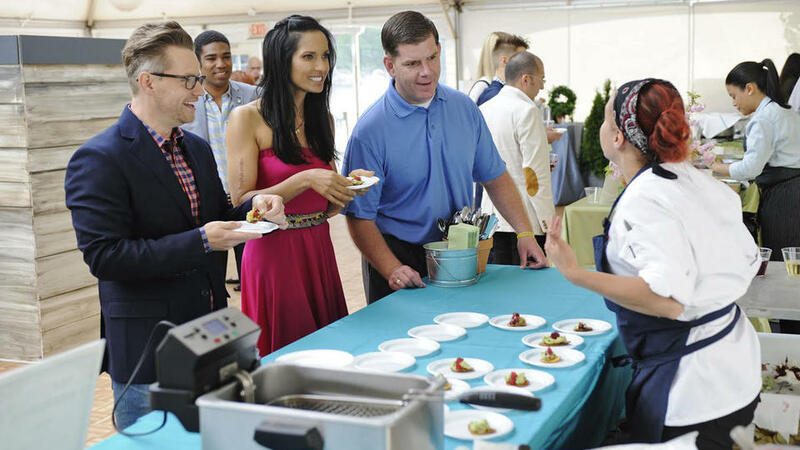 Posted by amandatalkstv on October 16, 2014 in Uncategorized and tagged Boston, CJ Jacobson, Elimination Challenge, Gail Simmons, George Pagonis, Gregory, Mei, Mike Isabella, Padma, Quick Fire, Richard Blais, Sudden Death, Top Chef, Top Chef Food Festival. Padma had some great quotes in this episode. I can’t figure out why Aaron would’ve given her that piece of pork belly.. to me, it looked like there were others ready to serve. And Richard got the good piece instead of her? Rude, haha. Oh I agree on all your points! It definitely looked like there were other pieces to serve and they couldn’t all be that fatty. I think he was just trying to save face by saying that he had no choice but to give her a fatty piece. The judges seemed especially brutal for it being the first challenge but I loved it!